I offer mini, quarter, half, and whole beef + half and whole lamb + half and whole pork. Payment is done in two steps, as there is no way to know the exact weight of each beef, lamb, and pork until they are processed; such is the nature of nature. The initial deposit reserves your order. The final balance will be invoiced in early July and is the balance between your deposit and the final hanging weight of your meat. 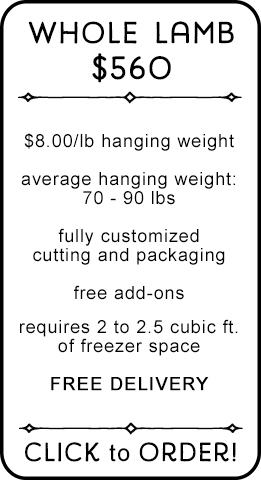 All payments are based on hanging weight. 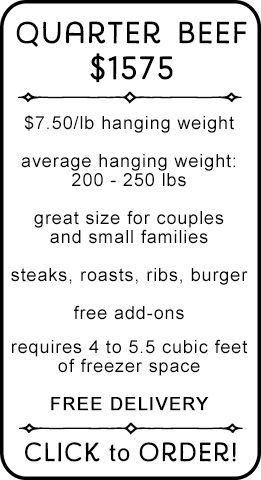 Hanging weight is the weight of each beef, lamb, and pork before the dry aging process and before it is cut and packaged (lamb and pork are not dry aged). Packaged weight is always less than hanging weight, primarily due to the dry aging process (SO worth it). 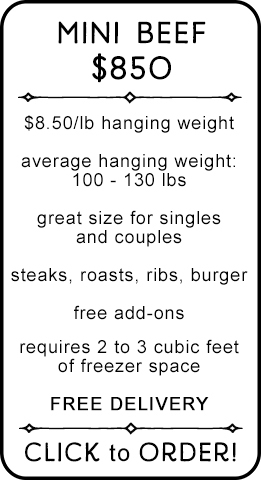 Other factors are whether steaks and roasts are boned out or cut with the bone in, and the excellent trimming job done by my butcher. 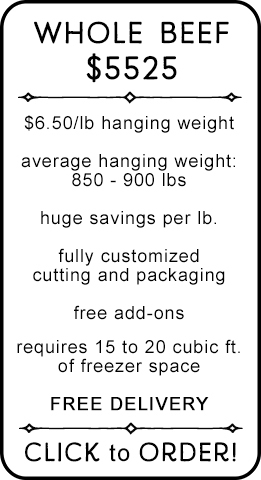 Packaged weight of beef, after dry aging, cutting, and trimming, is approximately 60% – 65% of hanging weight. 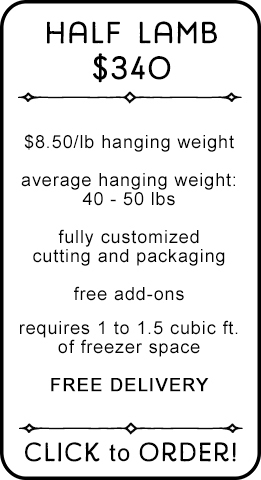 To determine an estimated packaged weight based on hanging weight, multiply hanging weight by .65. Packaged weight for pork averages 75-80% of hanging weight. Packaged weight for lamb averages 75-85% of hanging weight. I have been able to accommodate these request in all years past. 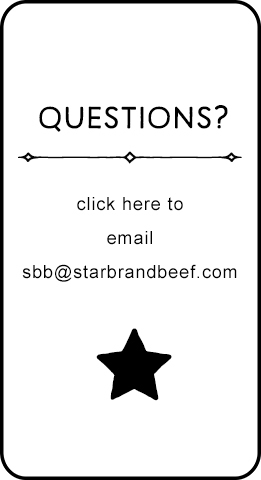 If you have any questions about any part of the process, please don’t hesitate to contact me!